Thanks for your visit. This website has been renewed with English pages and changed the title from "marimba!" 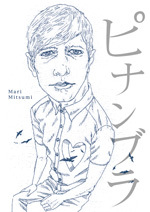 to "mari mitsumi illustrations" since October 2005. Hope you have enjoy looking around. Please update your bookmarks and address book, thank you! 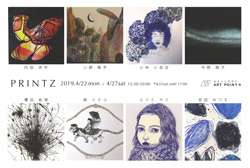 from Apr 22 to 27 at GALLERY ART POINT,Ginza, Tokyo. It's a group exhibition by eight printmakers at the contemporaly art gallery, in Ginza. Since the last solo show in 2014, I will participate in the exhibition of copperplate prints in Tokyo for the first time in 5 years. After some twists and turns, finally I felt to be able to find my own unique worldview of copperplate printing and to have got close to the image in my head. The images will be uploaded on facebook, instagram and this Gallery. Hope you'll like them. ●The illustrations featured ; ILLUSTRATION FILE 2019 published by Genkosya (Japanese only). They were also appeared on ILLUSTRATION FILE Web site. The Season's Greetings cards 2019 with Hand linking press (letterpress printing machine) based on the etching work called "Modern Love-1" (detail) was updated on [home]. "18th Lin Print Workshop Exhibition"
at Kanagawa Kenmin Hall . In this show, I'll exhibit three etching portrait works with hybrid paper prints. It's my brand-new style etching works for the etching group show at Ginza in next spring. published by Genkosya (Japanese only). They are also appeared on ILLUSTRATION FILE Web site. 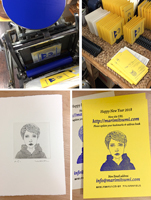 I've printed the New Year greeting card with a Hand linking press (letterpress printing machine) again. 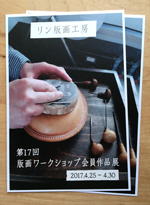 The new title image, photos of the postcards, the hand linking press, and the etching work on the basis of the resin relief of letterpress printing plate was updated on [home]. If you have links or bookmarks to this site, please update them now and continue visiting my site, thanks. by three selectors, Chihiro Takahashi, Hiromi Mikoshiba, and Fuyuhiko Yamamoto"
is now being held including my piece. It's the art show, not the illustration one. at Gallery Gallery Echo-ann , Ginza, Tokyo. This show was featuring the world of Japanese famous novelist, Haruki Murakami's novel. I've selected THE SPUTNIK SWEETHEART. I was a little nervous as I exhibited a painting work (acrylic paint on floating canvas) for the first time in three years. However I was surprised at myself to be really happy while I painted it at the same time. The image will be uploaded on Gallery 1 on next update. Hope you'll like it. "17th Lin Print Workshop Exhibition"
at The Hiratsuka Museum of Art . In this show, I exhibited only one etching work because of staying away from the studio for a while. But I'll start again from the next month and update new works on my site. For the exhibition, the luxurious book was collected short stories by 10 eminent writers into a single volume after serialized in the SPA Newsletter, that was made with hardcover; a style of binding, called "German binding" and 24 kinds of original design covers. It is limited sale only on this exhibition. I've drawn an illustration for the short story by Hiroko Minagawa in this book. ●It's just a quick note that I regret to inform you that the next solo show in September and some group show in this year were cancelled due to various reasons. I'll update if a kind of new exhibition will be fixed. "16th Lin Print Workshop Exhibition"
I exhibited two etching works; 4 dogs series(with letterpress words), and one cat for my next solo show in Sept.
●The book jacket illustration for THE TIN HORSE by Janice Steinberg has been CHOSEN to appear online as part of American Illustration 35 annual award. It's one of only 231 images from 10,003 submitted and is eligible to appear permanently on The ARCHIVE - AI-AP'online. It's the etching work called "Cloud Eight" finished up with digital painting by the book designer. I was so happy and felt relieved to hear because it's been two years since the last time I got accepted of the US annual competition that encouraged me. It's now featured in the American Illustration 35 Slide Show. ●The illustrations featured ; ILLUSTRATION FILE 2016 published by Genkosya (Japanese only). ● The image of the book jacket called Ningen Rinju Kou (An Observation on People's Last Moments of Life) by Tatsuya Mori was added on [ gallery 1 ] with portraits! 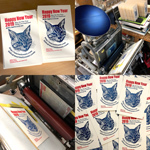 I've printed the New Year greeting card on a Hand linking press (letterpress printing machine) in the print work shop using kinds of a dozen or so papers. I took up letterpress printing one months ago, and is now really into it! 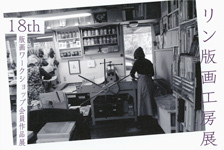 The new title image, a photo of the postcard with the letterpress printing was updated on [home]. ● The solo show 2016 will be held on the middle of September, so hold on till September please. ● The some published images were added on [ gallery 1 ]. I'll update the new works gradually, hope you'll visit here again. 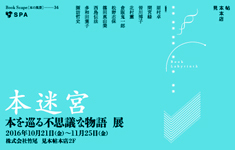 from today to Dec 13(Sun) at Museum of Onomichi City University. 15 etching works of me have been exhibited in this exhibition. ●Ningen Rinju Kou (An Observation on People's Last Moments of Life) was out in October. ●THE TIN HORSE was out in August. This work was one of the etching pieces called 「Cloud Eight」 for my last solo show "EDEN". The big image will be uploaded on Gallery 1 soon on next update! I selected the song called "Les Moulins de Mon Coeur (The Windmills of Your Mind)" by French composer Michel Legrand. It was used as the theme for the 1968 film, The Thomas Crown Affair and won the Academy Award for Best Original Song. My work was finished up with the digital colored etching and record jacket sized (300x300mm) print. Also the cd jacket designed by Chihiro Takahashi will be exhibited together and you can listen to the song while seeing the works. The image of this piece will be added on after the show. Hope you'll visit again. ●The illustrations featured ; ILLUSTRATION FILE 2015 published by Genkosya (Japanese only). ● I'll participate in the group exhibition called "15th Lin Print Workshop Exhibition"
at The Hiratsuka Museum of Art . I tried a little bit larger multicolor printing (etching + aquatint) work. ●Soon I'll also update the informations of the another group exhibition in June! ● Happy New Year 2015! The new title image called TABULA RASA, a photo of the new etching+aquatint work postcard with the letterpress printing was updated on [home]. I'll update the new etching works gradually, hope you'll visit here again. ● The image of the book jacket called THIS IS THE LIFE by Alex Shearer was added on [ gallery 1 ]. ● I got word that the book jacket illustration of ROMANCE was also selected in the Book category as an Honorable Mention which will be displayed on the 3x3 Illustration Annual No.11 Website. ● The new section of the all images for the solo show "EDEN" was uploaded on [ gallery 2 ]. Check them out, thanks ! 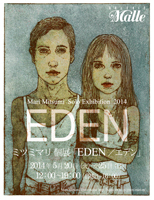 ● The solo show 2014 "EDEN " has finished, thank you. The updated new title images on [home] called "METAMORPHOSIS-NOT NARCISSUS : Adam / Eva" were two of the pieces from the show . ● I just got a chance to start learning etching from this January, though I'd always wanted to try. So this solo show was a big challenge for me. From that ended up to yielding a variety of styles for this show such as etchings and digital colored etchings in addition to the digital drawings and acrylic paintings as usual. The images of the new pieces will be uploaded on [Gallery 2] at an early date. I'd like you to see the new series. Hope you'll visit again! The invitation card image is one called "Let's get lost"(detail) from a series of personal piece combines etching with digital painting for this solo show like "Cloud 9" which was selected in appear in AI33. Etchings, digital colored etchings, acrylic paintings, digital paintings, etc… some new style works will be exhibited. The title come from the Everything But The Girl's first album! will be exhibited with book in this show. ●I'm so delighted to hear this piece called "Cloud 9" has been selected to appear in American Illustration 33 annual award book ! It was one of only 384 images to appear in the book and represent the best pictures from 2013. from 9,720 submitted. It's my first etching work finished up with digital painting and it gave me a lot of confidence for my upcoming solo show in May. Thanks! ● This is the Life was out in March. This illustration was one of the works for my solo show called "tangible" in 2008. I was so glad that the great book design gave new life to my past work. The big image will be uploaded on Gallery 1 after the solo show in May. ●Also my works appeared in WORKBOOK ON BOOKS10 edited by Japan Society of Publishing Arts (SPA) and published by Genkosya. The above mentioned exhibition ties up with this book. ●The illustrations featured ; ILLUSTRATION FILE 2014 published by Genkosya (Japanese only). ●Soon I'll update the solo exhibition "EDEN" invitation image and detail informations! ● Wishing you a happy new year! The new title image was updated on [home]. ● I was pleased that the book jacket illustration of ROMANCE was selected for the Society of Illustrators Illustrators 56 annual book and exhibition in the Book category. from February 05 to March 01, 2014 at The Society of Illustrators. ● The new title image from the work for the new book jacket was updated on [home]. ● The image of the new book jacket called Romance by Koji Yanagi was added on [ gallery 1 ]. ●Also the image of the flyer for the music & outdoor festival in Nagano called "peaceful garden 2013" was added on [ gallery 1 ]. In this time, I aimed at kind of vintage image as the flyer was printed on kraft paper ( the retro print is now in fashion in Japan). I was glad that the image of MADAPPLE cover was selected for three competitions (CA, AI, 3x3) of this year. It gave me kind of confidence. ● The new title image from the work for the new book jacket updated on [home]. ● The images of the new book jacket published was added on [ gallery 1 ]. It's been a pleasure working with Kazuo Miyagawa because he has designed for the book design for Alice - The Book Cover Exhibition for The new world of [Alice's Adventures in Wonderland] in 2010 (It was chosen to appear on American Illustration 30! 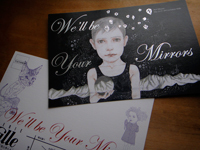 ), and also designed for my solo show 2012 We'll be your mirrors DM. ● The image of MADAPPLE is now featured in the American Illustration 32 Slide Show , and also in Illustrators 54 Annnual gallery of Communication Arts. ● I've heard that one of my piece MADAPPLE for the book cover illustration was also 'chosen' to appear on their online gallery for American Illustration 32 . It was one of only 401 images chosen from 8,742 submitted, thanks to the jury concerned. ●The illustrations featured ; ILLUSTRATION FILE 2013 published by Genkosya (Japanese only). ●The images forAbe's Peanut was uploaded on [ gallery 1 ]. Hope you'll liked them. ●I'm pleased to announce that my NEXT SOLO SHOW was just decided on May in the next year (2014) ! I'll keep you posted the detail! ● I was so excited to announce my piece MADAPPLE for the book jacket illustration was selected to appear in Communication Arts Illustrators 54, the May/June 2013 issue in the Books category. I was so happy to hear that because it's for the first time to be accepted into CA annual. ● Abe's Peanut is the mailable art and literature publication for kids that 4 postcards arrives weekly through the mail from NY. And I'm thrilled to announce that I could collaborate with Daniel Handler ( He is best known as Lemony Snicket, the author of several children's books "A Series of Unfortunate Events" which made a movie called "Lemony Snicket's A Series of Unfortunate Events" ) on January issue. All of the story of Daniel's are awesome, I'm so touched and it's completely beyond my imagination! Wow, feelin blissful. I loved it so much. To almost Illustrators, we can draw for the story, but there is little possibility to write for our works. I felt I was fortunate and honored to have collaborated with the great author like Daniel. The images of this works will be uploaded on [ gallery 2 ] after February. ● I was happy and relieved to find out LOVE & SYSTEMS book jacket illustration was selected for the Society of Illustrators Illustrators 55 annual book and exhibition in the Book category. from January 30 to March 02, 2013 at The Society of Illustrators. ●My works appeared in "The Style Book of Book Design and Illustration (Gentosya MOOK WORKBOOK ON BOOKS 9) 2012 " edited by Japan Society of Publishing Arts (SPA) and published by Genkosya. The above mentioned exhibition ties up with this book. ● The new title image from the solo show updated on [home]. ● The images of the new book jacket published in Japan was added on [ gallery 1 ]. ●The new section of the all images for the solo show "We'll be Your Mirrors" was uploaded on [ gallery 2 ]. Check them out, thanks ! ● Just a quick upload two small book jacket images which were out on 24th Augst. It was an inspiring, unforgettable work with awesome talented designer and editor, and I learned a lot. I love this great story and hope this book will reach a wide audience. The big images was uploaded on [ gallery 1 ] on 12nd October. ● The new title image from the solo show was updated on [home]. 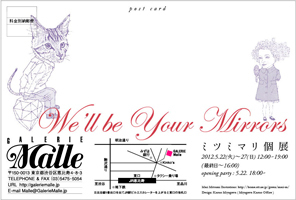 ● The solo show 2012 "We'll be Your Mirrors" has finished, thank you for coming! It was an amazing week, great experiences for me. ● The images of the new pieces will be uploaded on [Gallery 2] in the not-too-distant future. 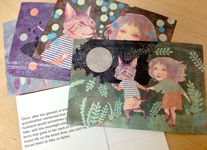 ●The illustrations featured " Illustration FILE 2012 " published by Genkosya. More information; Genkosya HP(Japanese only). They were also appeared on "Ilustration File web" site. The title come from famous song of "The Velvet Underground and Nico"album. All New works will be exhibited! ● some images of the published and unpublished works were uploaded on [Gallery 1] & [Gallery 2]. for the Society of Illustrators' "Illustrators Annual 54" as Sequential category following 3x3 Annual No.8! from Jan4(wed) to 21(sat), 2012 at The Society of Illustrators. I wish I could go to see...! 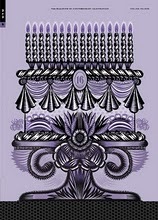 SPA has continually held Original BOOK-cover exhibitions by book designers and illustrators of SPA members and the theme of this year is juvenile literature with fine papers and sprcial printings like hot stamping. My subject was "A Christmas Carol" by Dickens with hologram printing on sprcial paper in collaboration with book designer Shintaro Usui. You can find and feel how the book covers are beautiful in this show. ●Two pieces of my works were appeared again in "Illustration Now Calendar 2012" published by Taschen (editor:Julius Wiedemann). I was a little bit surprised and appreciated to know because they have been appeared once in Illustration Now! Vol.1 andin calendar 2006 , furthermore they were made for my first solo show in 2002 (it's 10 years ago)! 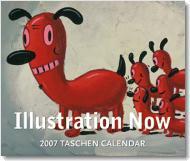 More information; Taschen Illustration Now 2012 Tear-off Calendar and AMAZON. 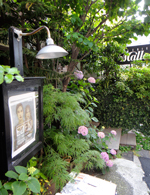 ●THE NEXT SOLO SHOW will be held in late May 2012 at GALERIE Malle Tokyo. So excited! The more information will be updated soon . ●5 images of series from "The new world of [Alice's Adventures in Wonderland]" for Gallery was accepted into 3x3 Annual No.8. It means a lot to me that that they were recognized by Westerner judges because [Alice's Adventures in Wonderland] is the world-famous Western novel...! It gathers portrait works of over 80 illustrators from all over the world, many of whom were featured in Illustration Now!, and mine is 6 pages long (8 pieces) in this book. I'm so happy that my works were appeared again in this great series of Taschen. ● The title image was updated on [home]. at art and with di-verse backgrounds and cultures of three international illustrators in every issue. It is composed of the luxurious contents with the articles of essay type interview by the fellow illustrator, photos of the work environment, a list of 20 Questions, and several artworks. Hiromichi Ito who is talented illustrator and was recognized by many US annual competitions has undertaken to write my interview, and luckyly, he is a good writer too! his essay was beyond my expectations, I love it! Also let me say thank to Junei Sakano for taking my studio images, Ayako Oda for translations of the interview, Kennichi Nakamura living in NY for proofreading, and Tatsuro Kiuchi who is famous world wide illustrator for good advises...without them, I'm sure that I'd never have been completed at all. And finally thank you so much Charles Hively, the publisher of 3x3, I really appreciate you have given me this GREAT rare chance! The current Issue 16 is now on available on Barnes & Noble and some independent newsstands in the US and Canada, and will be out in June 01in UK and Europe. Following images are just some examples of my pages. You can see the further informations about 3x3 here, and you can get it on here. 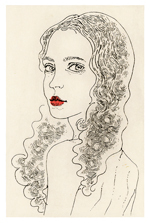 ●"Illustration Portraits Now ! "will be soon out in June by the German publisher TASCHEN and my pieces will be appeared as one of 80 illustrators all over the world. Wow. ●The illustrations featured " Illustration FILE 2011 " published by Genkosya . ● I got word that one of my work was 'chosen' to appear on their web gallery for American Illustration 30. My image will not appear in the book, but it was one of only 185 images chosen from over 7,000 submitted and that's a relief for me. ● I'm very pleased and proud to announce that I'm going to have my works and myself featured on 3x3 Issue.16 ! "3x3" is the US magazine of the art of contemporary illustration and Issue 16 will be on newsstands in the US at the end of April, mid-May in the UK and Europe. I'll give the details later after publishing. It's one of the [Penumbra] series which has been exhibited in the solo show in the last year. The reason why I selected this piece is that one of the subject of this piece to me was " hope and pray ". ● The new image was added on [Gallery 2]. ●The images of illustration for the new book by the Japanese best-selling writer and economist are uploaded on published works [Gallery 1]. ●To commemorate of the 150th anniversary of the Germany-Japan Friendship, "German-Japanese Contemporary Art Exhibition 2011" will be held from May 27 to June 9 at Gallery DEN in Berlin, and I'll exhibit one piece. The details will be informed later. ●The images of The new works from The group show "Malle de Alice - The Book Cover Exhibition for The new world of [Alice's Adventures in Wonderland]" have been uploaded on [Gallery 2]. ● THE GROUP SHOW "Malle de Alice - The Book Cover Exhibition for The new world of [Alice's Adventures in Wonderland]" has finished, thank you for coming. ● The images of this exhibit works will be uploaded on [Gallery 2] soon. ● AI-AP Party photos here (Tatsuro Kiuchi's Flicker) (or on my Facebook album). ● I'm going to NY from Nov 9 to 13 to attend the American Illustration 29 annual publication party! ● My works and the article of solo show at COUZT has appeared in p.83 and P.109 of the magazine called "Illustration" No.186(_2010.11) by Genkosya. According to P.83, now you can see on this site too. ● The new works of the solo show were added on the NEW section"Penumbra" of [Gallery 2]. ● 3 images of published works including Ads "VALUE BORDEAUX 2010" have been uploaded on [Gallery 1]. ●The solo show "Penumbra"has finished ! It was a great opportunity for me. Thanks for coming. at COUZT CAFE+SHOP (Japanese only). It has also dealed in my postcards. illustration for French Bordeaux Wine " VALUE BORDEAUX 2010". ●The Ads illustration for French Bordeaux Wine " VALUE BORDEAUX 2010" has appeared in the News paper" The Asahi Shimbun " and the mgazine " ELLE a la table "etc. ● My works "King for a Day" also has been accepted into 3x3 Illustration Annual No. 7. 3x3 Annual No.7 will be out in next fall. I'm grateful that this piece has been recognized by three illustration annuals of this year. ● I'm pleased to announce that my piece titled "King for a Day" has been selected to be in American Illustration 29 too! It's mean a lot to me. It will appear in the AI 29 annual book and also in the permanent collection on the AI website for life. ● 6 images of the published works were uploaded on [Gallery 1]. ●My illustrations appeared on the online newsletter of Abe's Penny which is the New York city based micro art magazine created by Anna and Tess Knoebel. Abe's Penny is one of a kind and I hope if my pieces were of some help to them. 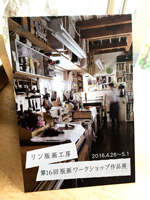 ● I've became a member of The Society of Publishing Art in Japan since Jan, 2010. ● My illustration has been selected for the Society of Illustrators' " Illustrators Annual 52 ".
" King for a Day " was chosen for Uncommissioned category (uploaded on "joyride" of [Gallery 2]) and it is a great honor to be included in this Awards Annual. at Museum of American Illustration at the Society of Illustrators. ● 4 new images of works from "The Seven Roses Exhibition" were uploaded on "joyride " of [Gallery 2]. 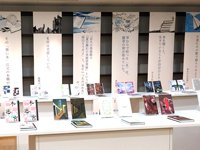 ● 2 images of the best seller novels' cover illustration were uploaded on published works [Gallery 1]. ●THE GROUP SHOW "The Seven Roses Exhibition" has been finished at Gallery DAZZLE. Thanks for comming. The new images of this works will be uploaded on " gallery 2 " soon. ●I will plan to move out on June 15. This site and e-mail address remains the same. ●"joyride" in [Gallery 2] has also been re-designed, and some new images of " Unpublished works " have been added. ●The main part of [Gallery 1] has been re-designed, and a lot of NEW images of " Published works " have been added at last. ●All NEW images of works from my solo Exhibitions in 2008 was added on "gallery 2 (tangible + next to silence)"
I regret the delay my uploading for a long time, and thanks for your visit again to see them ! ●The illustrations featured " Illustration FILE 2009 " published by Genkosya . ●THE SOLO EXHIBITION " An Echo In" has finished at taachi . All NEW images of works will be uploaded on " gallery two " maybe till the end of November, thanks for your visit again! ●THE SECOND SOLO EXHIBITION has been finished at GALERIE Malle. All NEW images of works will be uploaded on " gallery two " soon. ●The illustrations featured " Illustration FILE 2008 Digital " published by Genkosya . All New works will be exhibited! This Show has been decided suddenly on Jan 08 and now I've been busy with this preparation. The show title and more information will be updated soon again. "2007 TASCHEN CALENDER Illustration NOW!" 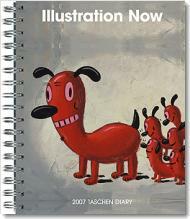 and "2007 TASCHEN DIARY Illustration NOW!" published by Taschen (editor:Julius Wiedemann). One large size work will be exhibited. ●All 20 pieces of new works have been added on "gallery 2 (joyride)". ●This site has been re-designed for web usability by web designer, Ms Atsuko kawata! And new works have been started adding on "gallery 2 (joyride)". ●The illustrations will be recently featured in " Illustration Now! " published by Taschen in October 2005 (editor:Julius Wiedemann) . ●The illustration was appeared in "illustrators tsushin"Vol.5 in June. More information; WEB illustrators tsushin. ●The illustrations were recently featured in " Illustration file 2005 Digital " published by Genkosya in April. More information; Genkosya illustration .